زهیری, علیرضا. (1396). هویت حوزه‏ای و انقلابی ‏بودن به مثابه امر سیاسی. فصلنامه علمی تخصصی سیاست پژوهی, 4(8), 103-132. علیرضا زهیری. "هویت حوزه‏ای و انقلابی ‏بودن به مثابه امر سیاسی". فصلنامه علمی تخصصی سیاست پژوهی, 4, 8, 1396, 103-132. زهیری, علیرضا. (1396). 'هویت حوزه‏ای و انقلابی ‏بودن به مثابه امر سیاسی', فصلنامه علمی تخصصی سیاست پژوهی, 4(8), pp. 103-132. زهیری, علیرضا. هویت حوزه‏ای و انقلابی ‏بودن به مثابه امر سیاسی. فصلنامه علمی تخصصی سیاست پژوهی, 1396; 4(8): 103-132. بررسی رابطه حوزویان با انقلابی‏بودن به مثابه امر سیاسی، نشان از آن دارد که ساخت هویت حوزه‎ای تحت تأثیر موقعیت و شرایط ‏کنونی از یک سو و تعریف دیگران از حوزویان و همچنین تعریفی که حوزویان از خود دارند، باید مجدداً بازنمایی شود. Islamic revolution followed by establishment of Islamic Republic, created new relationships in social, political and economic relationships and also created new conversations that its goal was renovating the society on the basis of Sharia law. In the new conversations, identity structures through political theology based on Shiite Islam provided a powerful draw from Muslim citizen identity that were accepted voluntary very much. This value logic created a new semantic system which was the basis of creation a new identity for revolutionary activists. Among, interference and accordance of interests, and the goals of Clerical institution with political system and establishing a kind of belonging and conformity between these two, have created a new situation and identity for religion and its supporters. Berthing the religious affairs besides political affair have implemented groupings within the institution of the clergy and clerics. The effects of situations and environmental context on one hand and different readings from religion and even thought and manner of Imam Khomeini on the other hand, have differentiated their encounter with politics. If we know being revolutionary as a basic factor of political affair, this question should be answered that what is the meaning of revolutionary field and What is the relationship between seminary and revolutionary identity? 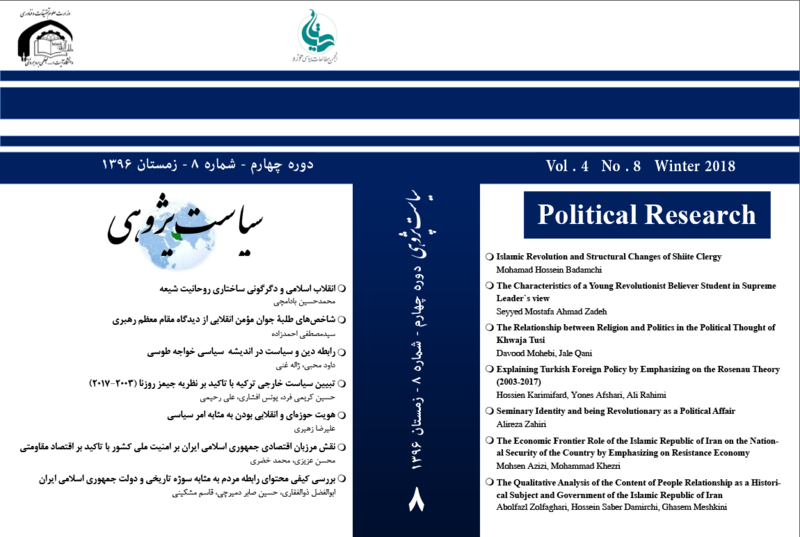 Reviewing the relationship of clerics with being revolutionary as a political affair, shows that building seminary identity affected by present situation and conditions on one and others definition from seminaries and also their own definitions from themselves should be represented again.